THIS ITEM IS NOT AVAILABLE AT PRESENT. WE WILL NOT BE GETTING ANYMORE Star Wars Episode VII Large Recycled Shopper Tote. From the Star Wars The Force Awakens collection by Vandor. 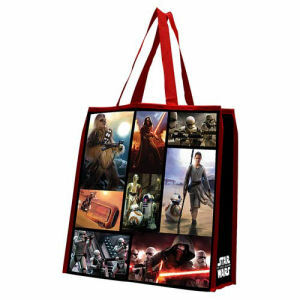 Star Wars Episode VII Large Recycled Shopper Tote. The large recycled tote is earth-friendly (made of 25% recycled materials), strong and water resistant. Tote measures 14.5 inches long by 13 inches tall by 6 inches wide. The strap features a 9 Inch drop.